Linux & Ubuntu News, Reviews, Hacks! UEFI has a pretty bad reputation among many in the Linux community. UEFI unnecessarily complicated Linux installation and distro-hopping in Windows pre-installed machines, for example. Linux Boot project by Linux Foundation aims to replace some firmware functionality like the UEFI DXE phase with Linux components. UEFI is a standard or a specification that replaced legacy BIOS firmware, which was the industry standard for decades. Essentially, UEFI defines the software components between operating system and platform firmware. UEFI boot has three phases: SEC, PEI and DXE. Driver eXecution Environment or DXE Phase in short: this is where UEFI system loads drivers for configured devices. LinuxBoot will replaces specific firmware functionality like the UEFI DXE phase with a Linux kernel and runtime. "Firmware has always had a simple purpose: to boot the OS. Achieving that has become much more difficult due to increasing complexity of both hardware and deployment. Firmware often must set up many components in the system, interface with more varieties of boot media, including high-speed storage and networking interfaces, and support advanced protocols and security features." writes Linux Foundation. LinuxBoot will replace this slow and often error-prone code with a Linux Kernel. This alone should significantly improve system startup performance. On top of that, LinuxBoot intends to achieve increased boot reliability and boot-time performance by removing unnecessary code and by using reliable Linux drivers instead of lightly tested firmware drivers. LinuxBoot claims that these improvements could potentially help make the system startup process as much as 20 times faster. In fact, this "Linux to boot Linux" technique has been fairly common place in supercomputers, consumer electronics, and military applications, for decades. LinuxBoot looks to take this proven technique and improve on it so that it can be deployed and used more widely by individual users and companies. LinuxBoot is not as obscure or far-fetched as, say, lowRISC (open-source, Linux capable, SoC) or even OpenPilot. At FOSDEM 2019 summit, Facebook engineers revealed that their company is actively integrating and finetuning LinuxBoot to their needs for freeing hardware down to the lowest levels. 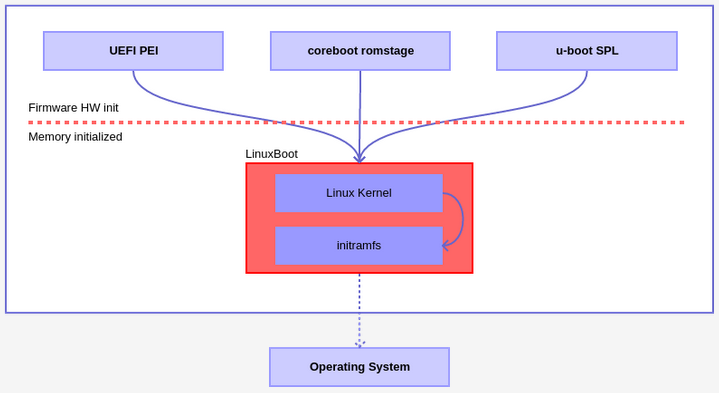 Facebook and Google are deeply involved in LinuxBoot project. Being large data companies, where even small improvements in system startup speed and reliability can bring major advantages, their involvement is not a surprise. To put this in perspective, a large data center run by Google or Facebook can have tens of thousands of servers. Other companies involved include Horizon Computing, Two Sigma and 9elements Cyber Security.